Thank goodness today was less challenging than yesterday – several times my legs reminded me they had worked extra hard yesterday and were not full strength today. Left Globe via US 60, but quickly transitioned to US 70 where we spent the rest of the day. 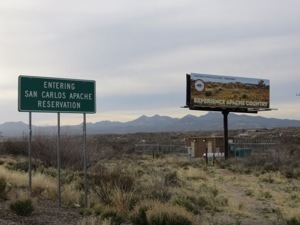 After just six miles we entered the San Carlos Indian Reservation. For the first 20 miles, it was mostly downhill and we enjoyed every pedal stroke. Sadly along the route, we saw lots of tossed beer and liquor bottles, also many memorial markers – a very depressed area. 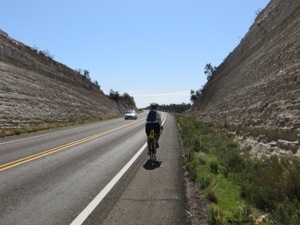 After the early downhill, we had rolling terrain, in many cases cut through the hills. 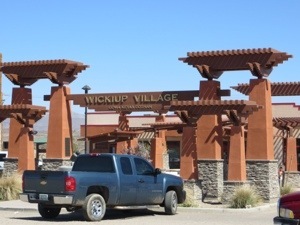 The sag stop at about 40 miles was in Bylas, and we enjoyed an Indian taco (Indian fry bread with beef taco ingredients). 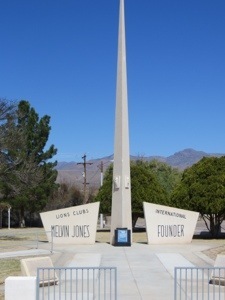 At Fort Thomas, I stopped at this historical marker honoring Melvin Jones, founder of Lions Clubs International who was born in the area. 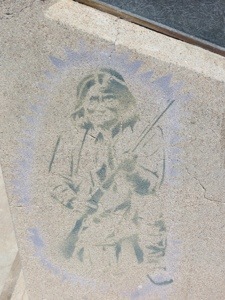 Further down the road was another historical marker for the town of Geronimo (no longer evident from the road), in the general area where the medicine man’s descendants lived. The final miles were flat and we enjoyed a gentle tailwind. 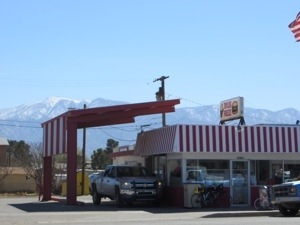 Stopped in Pima to have a milk shake at the Taylor Freeze, family owned since 1968. The 10,000 ft mountain in the background is Mount Graham (glad we don’t have to climb any part of it – and yes that is snow, though our temperatures were in the high 70s). 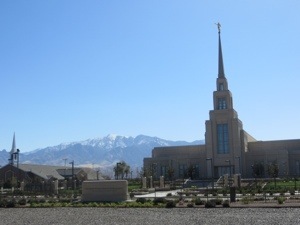 Final sight before entering Safford was this Mormon Temple, quite an impressive building in the middle of the Gila Valley. My roommate tonight is Julie Martin from Boise, ID. She is one of our sag drivers, taking special care of us when we are on the road. When not biking with us, she is a licensed professional counselor. Dolly – I may not comment often, but I am always reading and keeping up with you!! I envy your enthusiasm, spirit and joy. Thank you for sharing with all of us!! Prayers for you Dolly! What a great way to see the USA! Beautiful. AH, yes, Taylor Freeze. 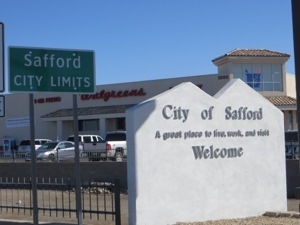 I had a green chile burrito and a milk shake. So much fun to eat like that, knowing I was going to work it off. Good job on your day and your post! 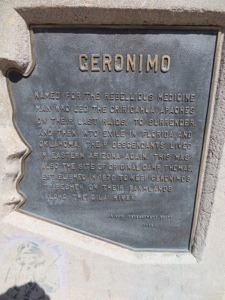 How well I remember the Taylor Freeze (and seeing the Geronimo Monument along the ride). I ate a green chile burrito and a milk shake with the comforting thought that I’d work it off the next day. Good job on your ride today and the post!